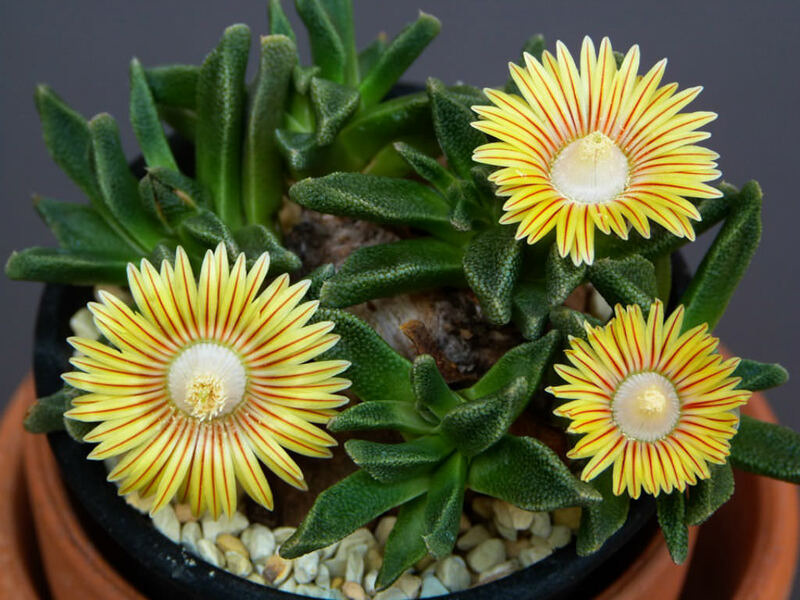 The genus Nananthus occurs widely in the interior of South Africa, in the Eastern Cape Province, Northern Cape Province, the Northwest Province, and the Free State. There is also a population in eastern Namibia. Nananthus is made up of a dozen of species of mesemb. It is related to Aloinopsis and Titanopsis. The thick-rooted plants are tufted with pointed leaves arranged in rosettes and the attractive flowers. The flowers are 0.75 inch (2 cm) wide, yellow, with occasionally some red. Hardy growers, Nananthus will do well in a clayey soil. In the wild, they are summer growers, but in cultivation they often behave as winter growers. Light: They need full sun or light shade on the other seasons. Temperature: Nananthus will take a small amount of frost for a short time (it is reported to be hardy to at least 10° F/-12° C). Keep cool in summer. Water: Water minimally in summer, only when the plant starts shrivelling. Soil: Because of the tap root they need a highly gritty compost with much drainage. Nananthus are propagated by cuttings and seeds. Nananthus are easy and rewarding plants. Coming from a more continental part of South Africa, Nananthus will tolerate intense heat, as well as some frost. They should be lightly shaded in summer. Water minimally, only when the plant starts shrivelling. They need full sun or light shade on the other seasons. They generally bloom in the fall.